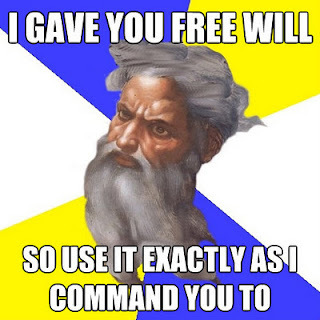 Another good review for "Free Will?" So I gave a speech to the Portsmouth Skeptics in the Pub group on Thursday night and, if I might say so, it went really well. High praise indeed - and a cable TV slot! A chap called George Ortega contacted me recently about a video of my free will talk to the South Hampshire Humanists. He runs a small local cable project about free will in the States. Anywho, he is planning on using the video as the backbone for four of his cable shows, which is great. Being nice is genetically determined? ScienceDaily (Apr. 10, 2012) — It turns out that the milk of human kindness is evoked by something besides mom's good example. Research by psychologists at the University at Buffalo and the University of California, Irvine, has found that at least part of the reason some people are kind and generous is that their genes nudge them toward it. I am really pleased to announce that I have another speaking engagement booked in Portsmouth, to talk to the Portsmouth Skeptics in the Pub about free will. The Skeptics in a Pub is a growing secular movement around the country, and I must say, I am really looking forward to it! I am going to use an unlikely tool to show the philosophical veracity of determinism – the belief that we have no free will. The evidence I am going to bring to the stand is / are Jedward. For those who don’t know them, they were X-Factor sensations from Ireland – identical twins who are so similar you just can’t tell them apart. And they do EVERYTHING together.